Crushing Dignity, Force-feeding Honour: The CPM is Back in Form Again! Mujadpur, a village in Haryana’s Hisar district, which has been in the news recently for what the government lexicon calls ‘dalit atrocities’, involving murders and ‘suicides’. Recently, it was hit by another such incident, albeit of a less fatal nature: Members of the Jat community thrashed a dalit man called Ramdhari and his family members and stuffed cow dung in his mouth. Reportedly, Ramdhari installed a statue of BR Ambedkar in his house and that provoked the upper caste Jats. The irony of this cannot be emphasised enough. One does not know whether in an area dominated by the Jats, Ramdhari’s perpetrators have been arrested under provisions of the Scheduled Caste and Scheduled Tribe Prevention of Atrocities Act (1989) or not. Or has the incident been explained away in the light of some vague personal animosity, which is what happened when two children in Sunped were recently killed by throwing of inflammable material in their house by dominant castes. As the nation begins another series of grand celebrations, this time to celebrate the contributions of BR Ambedkar, the plight of a dalit family for merely installing his statue stares at us in our eyes. It is symptomatic of the gap between the principles and values on which the Constitution is based and the situation on the ground. Will Naveen Patnaik please wake up to atrocities against Dalits in Odisha? Anand Teltumbde is a noted Bombay-based Dalit intellectual who also wears the hat of a business executive. He has written this book about the lynching of a Dalit family in a Maharashtra village in 2006 to ensure that the incident is not easily erased from memory. He quotes Milan Kundera: “The struggle against power is the struggle of memory against forgetting.” In other words, he sees this book as being a seminal work on the Khairlanji atrocity. The book begins with Abel Meeropol’s song Strange Fruit, written in 1936 (and not 1939, as the book incorrectly states) about the lynching of two black youth. 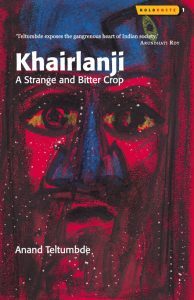 It is from this song that the book derives its sub-title, “A Strange and Bitter Crop,” which once again reinforces the book’s ambition. Billie Holiday’s rendition of Strange Fruit (in 1939) soon became an anthem for the anti-lynching movement in the US, but does Teltumbde’s book achieve its ambitious goal? The Gujarat Earthquake in the year 2001 and the consequent relief and rehabilitation programme was an eyeopener to the outside world regarding the deep seated caste bias in the Gujarati community apart from the much talked about bias against the minorities. There were reports that at places the relief and rehabilitation work bypassed the dalits and the Muslims.